Hellboy is both a superhero and horror comic book character. Created by writer-artist Mike Mignola, Hellboy first appeared in San Diego Comic-Con Comics #2 (cover date: August 1993). The character's debut in his own comic book was Hellboy: Seed of Destruction #1 (March 1994). However, some of the best Hellboy stories are short stories, and for over two decades, Hellboy shorts have appeared in a number of Hellboy comic books and also in the classic anthology, Dark Horse Presents. 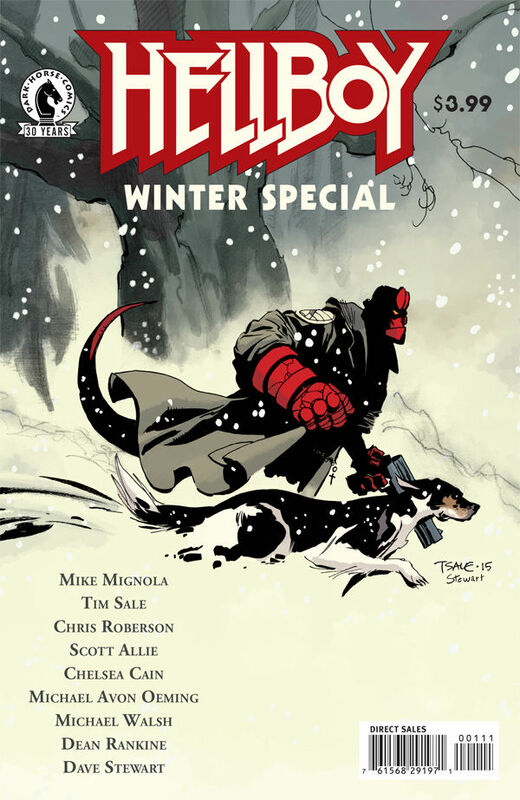 Hellboy Winter Special is a recently published Hellboy anthology that offers four Hellboy short stories and features two covers – a Tim Sale regular cover and a Mike Mignola variant. The first of the three snowbound stories is “Broken Vessels,” written by Mignola and Scott Allie and drawn by Tim Sale (in his Hellboy or “Mignolaverse” debut). In the story, which is set in Mignolaverse prehistoric mythology, a warrior shares his campfire with a seemingly deranged man who claims to be a shaman. Writer Chris Roberson and artist Michael Walsh enter the world of Hellboy in “Wandering Souls,” a Hellboy and the B.P.R.D. : 1953 story. This tale opens in Sweetwater County, Wyoming in 1953. Hellboy and Agent Susan Xiang are investigating a seemingly haunted camp, a place where Xiang will discover why she felt so compelled to accompany Hellboy on this mission. Simply put, I would recommend Hellboy Winter Special not only to Hellboy fans, but also to anyone who has ever read even a single Hellboy short story, let alone a full comic book. Hellboy is a true fantasy and horror comic book in a way that Doctor Strange and Doctor Fate comic books have never really been. Hellboy is a superhero, but Hellboy comics and stories (as well as those of the B.P.R.D.) are fantasy that encompasses action-adventure, mystery, ghost stories, fairy tales, folk tales, myth, etc. Hellboy is truly unique, and Mike Mignola and his collaborators have executed the long narrative of Hellboy and company with inventiveness and imagination. In a way, what Hellboy is can be said to be largely unseen in North American comic books. Hellboy Winter Special is a sampler pack, a taste of that Hellboy and Mignolaverse special way.